Getting ready for your Fall Festival Party? This is your perfect bow that will match any Fall outfit and get your little one ready for any party. The base is an orange grosgrain ribbon that is 2.25 inches wide. A pinwheel of gold, orange, yellow and white colored leaves and hearts will explode on top of this bow. There is four loops of orange ribbon with yellow polka dots in each corner of this bow. A shiny gold ribbon covered with a sheer orange ribbon runs through the center and a white grosgrain ribbon completes the center. 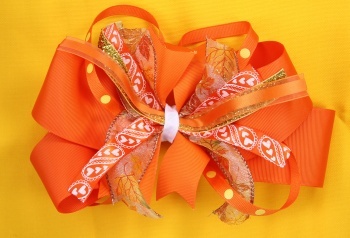 Enjoy all of your fall activities with this stylish Fall bow.